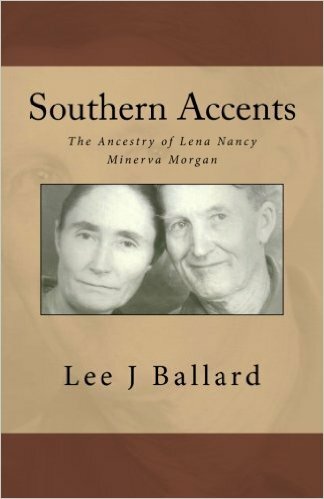 This book is written for two audiences: one, descendants of Lena and, two, those who wish a general history of southwest Alabama. Descendants of Lena should find this book of particular interest because it is their story. By no means comprehensive, this is the story of where Lena’s family (and thus her descendants’ families) came from, their struggles and victories. It is the story of what makes us who we are today. It may explain, in part, where some of our attitudes and beliefs may have come from. For future genealogists looking to tackle the Morgans and allied families (Champion, West, Sheffield, Hare, Shaw, Finley, Harvell, etc.) and correct any errors found here, this book should also serve as a solid starting place. The second, perhaps wider, audience is made up of those who are interested in a history of southwest Alabama, especially as it relates to the counties of Clarke, Marengo and Wilcox. Perhaps, your family tree mingles with Lena’s at some point. This offering presents a very brief survey of four-hundred years of social, political and economic history of a fiercely independent people who settled in Alabama. It is simply impossible to cover all of the topics presented here in sufficient detail to be anything other than an introduction. There are many very controversial, very complicated topics presented here, from the settlement of the Carolinas to the Indian Removals, from economic slavery to racial slavery, from the causes of the Civil War to the origin of the Jim Crow laws, what it means to be a Cavalier in a seemingly Yankee dominated country. Four hundred years is a long time and the history of the South, for its outward simplicity, from a Northern perspective, is complicated. From lowland Scotland to the Carolinas, from the Black Belt region of Alabama to east Texas, an interpretation of the historical context of five generations of one family is recounted here, starting with my great grandmother, Lena. Get it at . . .